I think I might have gum disease, what can I do? Gum disease or gingivitis occurs when the delicate gums around your teeth become inflamed. Gum disease progresses painlessly on the whole so you may not notice it until it is at a more severe stage. The first sign is that your gums may be slightly puffy, read or inflamed. At first this will be very mild and barely noticeable unless you look extremely closely (just as a dentist would during your regular dental health check). As the gum disease progresses you may find that the gums bleed occasionally during cleaning with a toothbrush. You will also find that if you clean between your teeth with a brush or floss that the bleeding can be worse. The problem is that people at this stage then tend to layoff cleaning their teeth quite so much as the gums bleed and become tender, however this can mean that the gum disease can progress further underneath the gum. If the infection spreads below the gum line it can then turn into the more serious periodontitis which affects the bone and can ultimately lead to tooth extraction or loss. 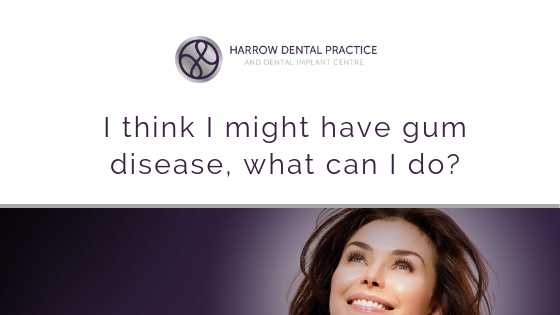 Is it possible to catch gum disease? No. Gum disease is not an infectious disease and is caused primarily by poor hygiene. However, if you have lower standards of oral hygiene without healthy gums your teeth may be more susceptible to any additional bacteria which are introduced into the oral environment. because of gum disease is a buildup of plaque over the teeth, this is a sticky substance which if not removed daily can build up into hard tartar. This is where bacteria lurk, these bacteria are producing acid as they digest food and it is this acid which causes tooth decay. Smoking. Smoking as a tendency to dry out your mouth, this drying out means there is less saliva to wash away food stuff and neutralise the acid attack. Changes in hormones. Particularly in girls and women, hormone changes can lead to sensitivity in the gums making gingivitis more likely. Your genetics. Unfortunately some people are more prone to developing gum disease than others. Diabetes. There are direct links between people with diabetes and gum disease. Your medications. Any medication which alters the flow of saliva can leave you more susceptible to developing gum disease. There are also some medications which promote abnormal growth of the gums, these can then be difficult to clean. Yes, it is possible to reverse gum disease. Depending on how severe the disease is and how far it has progressed depends upon the best course of action. The very simplest thing you can do is to start a more thorough oral health care routine ensuring that you are brushing your teeth at least twice per day for 2 min with the fluoride toothpaste (This helps to strengthen your tooth enamel) and that they are cleaned once a day with an incidental brush or floss. Do people with gum disease die early? The recent any research to indicate that people with gum disease necessarily die early, however there is research which links gum disease to certain other conditions including heart attacks. There has been research undertaken which is shown that people with heart conditions have the same bacteria present in their heart as is present with gum disease. More research is needed to establish if there is a causal link between gum disease and heart disease, however what is clear is that there is indeed a link between the two conditions. Tooth removal. If your gum disease is not kept under control then it can turn into the more serious periodontitis which can then lead to floss. Strokes. Studies have shown that up to 40% of the bacteria that cause the fatty deposits in People that have had a stroke come from their mouths which have inflamed gums. Respiratory disease. Because dental plaque harbours a considerable amount of bacteria it is inevitable that some of these could be respiratory pathogens, therefore a complication of gum disease could potentially be pneumonia, emphysema and chronic obstructive lung disease. Heart disease. Because the body is a complete system connected by its blood supply then any bacteria which gets into the blood in your mouth can make its way to your heart. These bacteria have been shown to lodge inside the walls of the blood vessels causing blood clots to form. Gastric ulcers. The same bacteria that cause gastric ulcers are also responsible for gum disease, this means that if you have a particularly high bacteria count in your mouth then as you swallow your food these bacteria are transferred to your stomach. Regular dental checks by your dentist and hygienist to ensure that you are cleaning your teeth adequately. Being aware of the food and drinks you consume to keep sugar amounts lower. 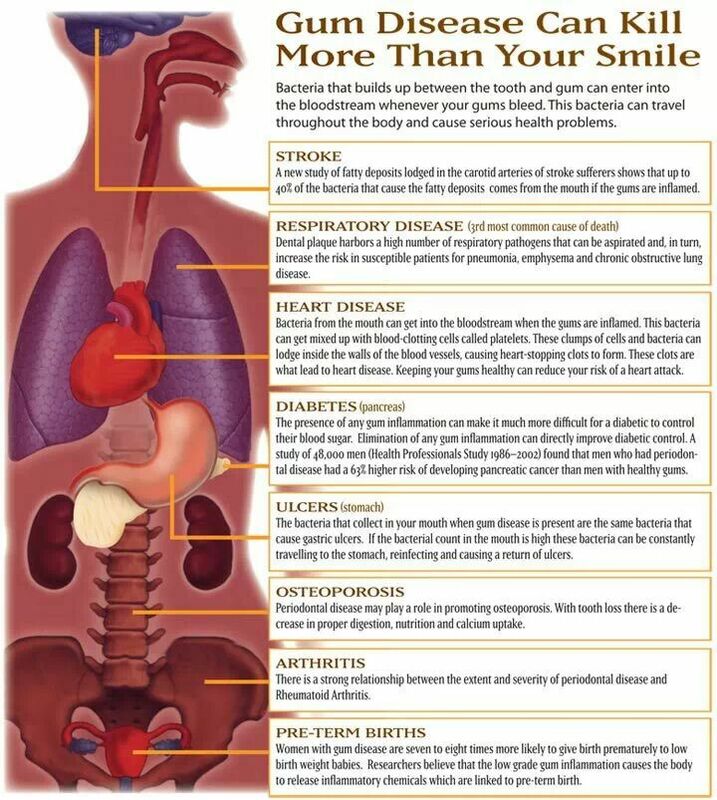 Ensuring that you have a good daily oral health care regime. Watch out for the early warning signs like bleeding gums and if it doesn’t clear up contact your dentist. Previous Previous post: Is there a link between the desire for Botox and Social Media use?